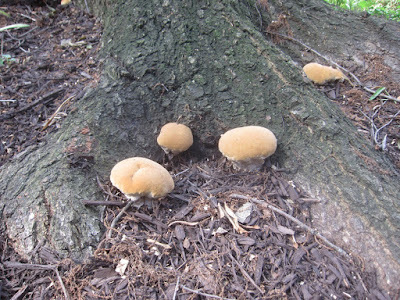 Mushrooms have again appeared at the base of the tree in the courtyard of the historically important Westmoreland Terrace Condos. These mushrooms appear to be similar to the ones that appeared in 2013, but somewhat different from the ones that appeared in 2014. These mushrooms are unlikely to attack humans, especially if they're not provoked. While some like to ridicule mushrooms and mushroom management, mushrooms help to reduce global warming. Did you take a spore print so that they can be identified. Also you need take a picture of the stipe and gills? Do they have a veil? Is there a bulb at the bottom of the stipe? In a recent reorg, the Tribune's mushroom specialist was shifted to covering Artisphere exhibits and events. The advertising sales manager received the additional assignment of covering mushrooms. He lacks sufficient expertise to make spore prints, etc. etc. We hope that the next reorg will further strength the coverage-skills alignment to continue to maintain the Tribune's leadership in our dynamic, network-based news environment.